If yesterday I just share a list of animals and their homes, right now I will share a list of animals and their babies names. What is a baby crocodile called? A baby crocodile is called a hatch-ling. What is a baby walrus called? A baby walrus is called a calf. What is a baby skunk called? A baby skunk is called a Kit and a group of skunks is called a Surfeit. What is a baby alligator called? A baby alligators is called hatchlings, a male alligator is known as a bull and female alligator is called a cow. 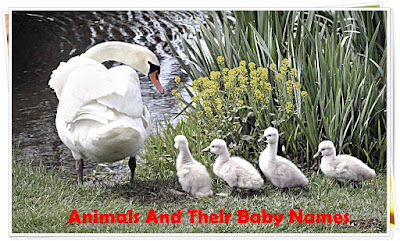 Because some people also asking for same questions so I will answer them all with a list below where you can found 100 popular animals with their baby or young name and also the name for adult male and female animals sorting alphabetically from a to z. If you think this animals and their babies names list was useful, please share it using social bookmarking below !.